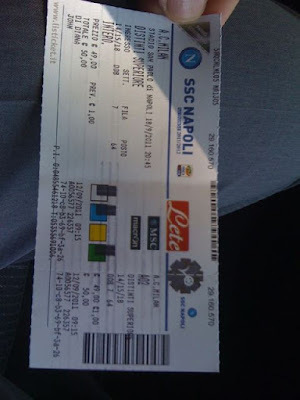 Stadio San Paolo and the game ticket. This was originally published in September 2011. 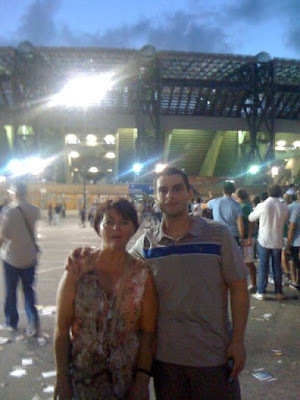 As you will read, supporting SSC Napoli is a passionate family experience. Please enjoy this excellent match commentary by John Di Diana. Sunday evening began for me about 6 p.m. local time. My cousin Andrea and his friend Nello picked up my mother and I from my aunt's house in Acerra, a province of Napoli about 20 kilometers from the Stadio San Paolo. We jumped on the Autostrade, which is a superhighway, and made our way. The closer we came to the stadium, you could tell the anticipation among the natives was building. People were outside everywhere. I mean everywhere on the streets. Flags, banners and the color of blue everywhere in sight. 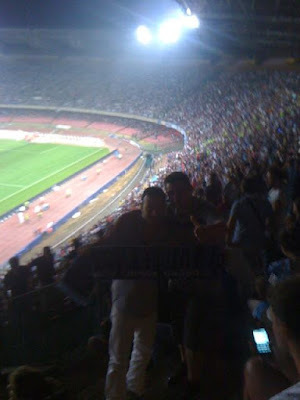 People outside of the stadium were selling everything 'Napoli' from scarves, flags, posters, bracelets and key chains. We decided to park in a garage a kilometer or so outside the stadium as parking was scarce and it is also not ideal to park on a public street with such a huge event. The author and his cousin. 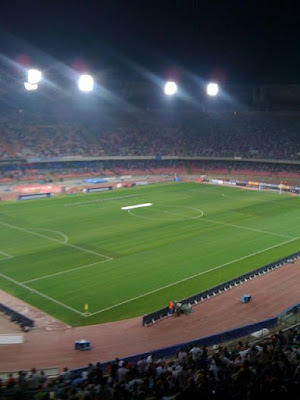 We enter the Stadio San Paolo and we have tickets for the Distinti Superiore. We try to get seats near the middle of the pitch but they are taken. We decided to buy seats in the corner near the Curva A. By the time we get to our seats, it is about 50 minutes until kickoff. Seats are filling up quickly and the banners begin to come out. The Curvas (areas with the most passionate supporters) are already filled to the maximum and singing and cheering has already begun. Light shows start to show up everywhere. People begin to start jeering the Milan players as they come out for pre-game warmups. Appropriately so, wild cheers begin for Napoli as they come out. At this time, the stadium is about 50,000 people deep and I get goosebumps. The last time that I was here was in 2000 for a Serie B match and the atmosphere was similar. But you can't compare this night night to that one. The players return to the dressing room and now the Milan supporters go to their seats where they are secluded. An enormous amount of whistles are shot their way. Now the announcement begins of the Napoli starting XI. The announcer says the players' first name and the crowd shouts the last name. After this is done, more flares go off and the match is about to kick off. The first 10 minutes Milan dominate possession. Napoli rarely touches the ball. They seem timid. After a foul outside of the Napoli box, a free kick towards Alberto Aquilani and he heads home a beautiful goal where Napoli keeper, Morgan De Sanctis, had no chance. The crowd quickly goes silent as everyone is in disbelief. Although we could see it coming. I said to my mother this is when the match begins. Wouldn't you know about 2 minutes later Napoli score! It's Edinson Cavani up to his usual tricks. 1-1 and the stadium is rocking! The Napoli dominance has just begun. The players settle in and Napoli look dangerous as ever on the counter. Napoli continue to grow with their attack and it pays off a few minutes before the end of the first half. Walter Gargano with a beautiful box-to-box run supplies Cavani with a beautiful pass where he beats Christian Abbiati to his near side: It is 2-1 and the stadium erupts again. I am going nuts because I have caught this wonderful moment live on the camera of my phone. Napoli really have control of the game and the first half ends. The second half starts as the first half ended: Napoli with loads of possession. 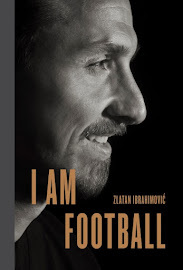 To me, the Milan players look tired. Especially Antonio Cassano. Then, wouldn't you know, Signor Matador strikes again! Another hat trick for Cavani and now the crowd is in absolute delirium. Two ridiculously loud "bombas" go off. Flares are lit. Singing from both Curvas is loud and immense. 3-1 to Napoli and the home team never looked back. They have the bulk of the possession in the second half and Milan really never threatened. Napoli should have really made it 4-1 on a few occasions. The final whistle blows and the game is over. 3-1 to Napoli and the reigning Serie A champions have been defeated. 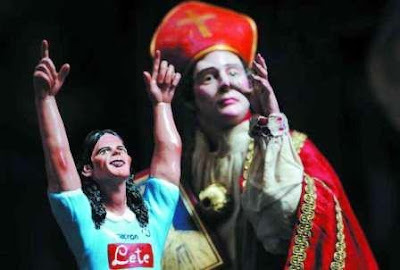 A figurine of Edinson Cavani. The crowd begins to sing "O Surdat Nnammurat." (A famous Neapolitan tune.) Everyone is hugging each other. The Curvas are still singing. This night is like no other in my life. FORZA NAPOLI la nostra unica fede si chiama Napoli! 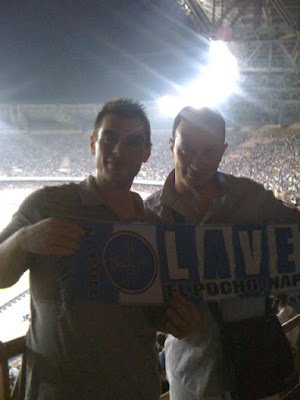 John Di Diana is from Chicago, Illinois, and is a passionate, lifelong supporter of SSC Napoli. You can follow John @ForzaNapoli_1 on Twitter. All images are courtesy of and copyrighted by John Di Diana. All rights reserved. John, thank you for the excellent game report. You demonstrated the passion that surrounds SSC Napoli.